Box Lunches are a great way to feed a group quickly. Eliminate waiting at the buffet. Everyone grabs their choice and they’re off to lunch. Box lunches include everything for the meal but the person and the beverage. Your best bet is to get an assortment of sandwich boxes and a few salad boxes. Decide on price – classic or signature and let us put together an assortment that represents the selection of food large groups normally pick. Or tell us how you want the assortment. Each lunch is individually marked and contains condiments, dressings, utensils, napkins, and a cookie. Choices: Choose from any of the items on our cafe menu. Classic deli sandwiches include our famous chicken salad, turkey, ham, rare roasted beef and vegetarian sandwiches. Signature sandwiches move it up a notch to our Chicken Waldorf, California Avocado, Turkey Bacon Avocado, hearty ABC, and more. All are made on fresh, baked that day bread. Salad Boxes start with our house, Caesar, and Greek salads and move up to the heavy weights. The Chopstix Chicken salad is the star of our signature salad line up with our balsamic bleu salad is standing ready in the wings. Add grilled chicken to any salad box. You choose, we box. Catering Tip: Unless your group is small, go with an assortment. Letting each person in a large group choose from the menu and then counting on them to make sure they get the box with their name on it can be difficult. Of course we mark each box with its contents and a name if requested. But an assortment for large groups allows everyone to see the area with the chicken salad boxes and the area with the greek salad boxes, pick one up and go eat. Saves time for everyone. Reduces the complexity for you and for your group. Want your order ready when you arrive? Need food for a meeting or event? Call now (256)922-2253. We'll help you come up with just the right selection for all of your guests. 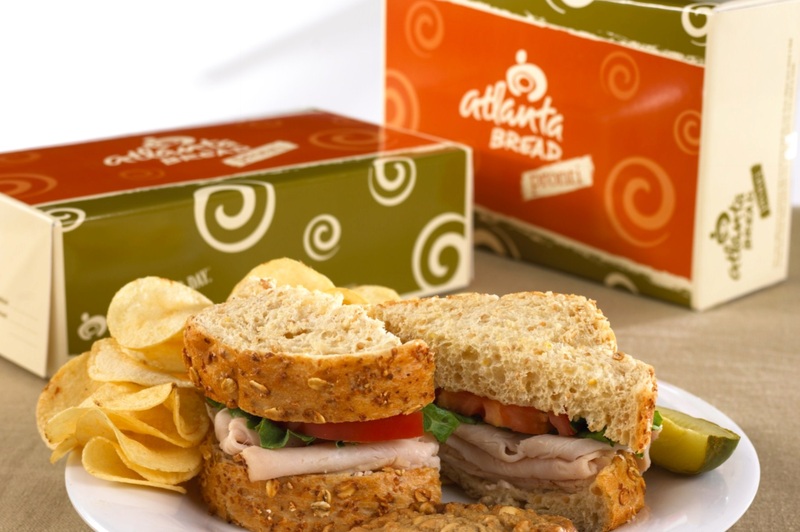 Atlanta Bread Huntsville is your neighborhood bakery cafe where you can meet friends over coffee and a cinnamon roll, have lunch with your work group, bring the family for dinner, or hang out by yourself and study, read, or just chill. BAKERY CAFE HOURS We are here to serve you seven days a week. Open Monday through Saturday from 6:30 a.m. until 9:00 p.m.
Open Sunday 7 a.m. until 7 p.m.
Monday, 4p.m.-9p.m. Free kid meal menu* with adult meal purchase. Breakfast, lunch, dinner, snacks, coffee, and catering. *only items from kid's meal menu included. All other menu items charged at regular menu price. ALWAYS FRESH: Walk through the doors at Atlanta Bread Huntsville and you immediately know you are in a bakery cafe. There is cinnamon and coffee in the air, fresh baked baguettes coming out of the oven, and that cookie aroma like mom's kitchen. When it comes to food, it's not how soon you finish, but how recently since it left the oven - the fresher, the better. All croissants, muffins, and breads are baked the day you see them. We start baking just hours before we open to have fresh baked bagels and pastries ready to go with your coffee early in the morning. You'll find us baking all day when demand is high for goodies. Bread served with your soup is baked just before meal times. HELPING OUR COMMUNITY: At the end of every day, leftover fresh baked croissants, muffins, breads are given to local organizations to help those in need. Find us at many fundraising events providing our neighborhood hospitality with food and beverage to support volunteers and participants. MADE TO ORDER FOR YOU: We are always happy to bake to order just for you. If you want a seasonal cranberry orange loaf or a dozen pecan rolls, call ahead, we'll have it ready for you in a few hours. Of course all sandwiches and salads are made to order featuring the freshest produce and quality ingredients. Our soups are renowned.